This facility of Nabil port infrastructure (Onshore Supply Base Kaigan) is owned by LLC “URE’K Transport”. Since 2010 LLC “URE’K Transport” is an affiliate company of JV LLC «Sakhalin-Shelf-Service» . • «Sakhalin Energy Investment Company Limited». 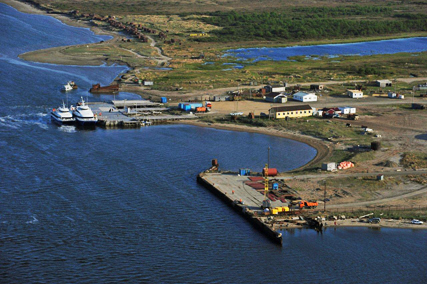 Kaigan shore base (Nabil marine terminal or Nabil Supply Base) is located in the north-eastern part of Sakhalin island on the western coast of Aslanbegov strait and includes waters of terminal which consist of internal water area with outer harbor and Kaigan base with two berths. The Base is located in close vicinity to oil and gas fields developed under “Sakhalin -1”, “Sakhalin-2” and “Sakhalin-3” projects. There is a support fleet in Nabil port (Kaigan shore base), providing crew change on platforms and supply vessels of “Sakhalin-1”, “Sakhalin-2” and “Sakhalin-3” project operators. During 2003-2004, 12 000 tons of different size pipes (D =530-1200 mm) were delivered under “Sakhalin-2” project. Since 2006 and until the present moment, drill waste management services have been provided in Nabil port. The main customers of this service are leading oil and gas field exploration companies as well as the companies, which do not have technical possibility to pump all drill waste or its part to the wells. Loading and unloading operations are provided by means of rented mobile cranes the number and capacity of which corresponds to the volume of cargo to be processed. Total are of open storage warehouses with hard surface - 2500 м2, with ground surface - 10 000 м2. Covered cold warehouse - 500 м2. It is possible to rent heated warehouses in the closest settlement – Nogliki.